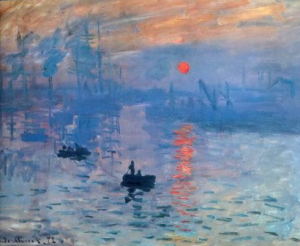 ArtScapades presents Impressionism and Post-Impressionism with lectures that can be used in a series, individually or customized to meet your needs. In each lecture, ArtScapades shows where the specific period of Impressionism fits into an abbreviated timeline of art history. In French Impressionism, ArtScapades gives the history of factors that brought the movement to Paris including the redesign of the city, the growth of the cafe culture, the impact of the Industrial Revolution, and advances in materials and technology. In American Impressionism ArtScapades explains how the movement arrived in America including the influence of art dealers, the education of American artists in Europe, and the formation of art colonies. In Post-Impressionism ArtScapades details how art moved past Impressionism, the influence of a single art critic, and how stylistic disagreements and personal animosities eventually brought down Impressionism. In Artists Abroad, ArtScapades looks at American artists who, despite their expatriate status, are among America’s greatest talents. In French Impressionism, ArtScapades chronicles the life of five artists and their works, Édouard Manet, Claude Monet, Pierre Auguste Renoir, Berthe Morisot, and Edgar Degas. ArtScapades looks at the American Impressionists William Merritt Chase, John H. Twachtman, J. Alden Weir, Childe Hassam, and Theodore Robinson. In Post-Impressionism ArtScapades presents Paul Cézanne, Georges Seurat, Paul Gauguin, and Vincent van Gogh. Approximately fifteen works per artist are discussed including iconic works plus those that illustrate significant trends and events in their lives and careers. In Artists Abroad, ArtScapades focuses on the works of Mary Cassatt, John Singer Sargent, and James McNeill Whistler.